'SPORSHO' - A BiH initiative is all about responsibility, humanity, compassion. It's all about reaching out to the troubled humanity. We are a non-profit organization built on the common platform of compassion and humanity. The only gain we desire, is to win hearts. And that is the main and only reason behind promoting SPORSHO. It's a collaboration of all those who CARE and care to SHARE, those who DARE and those who attain to bring others NEAR. These lines from William H. Davies’ poem “Leisure” rightly describe our life these days. We are too busy making a livelihood for ourselves to care much about anything under the sun, although there are times when we are troubled by the misery around us and feel a severe urge to eradicate them all. However, our busy lifestyle pulls us back into the same monotonous vortex and we leave the task for the NGOs to accomplish. What we don’t come to know about is there are many struggling NGOs with great thoughts and initiatives but lack support. 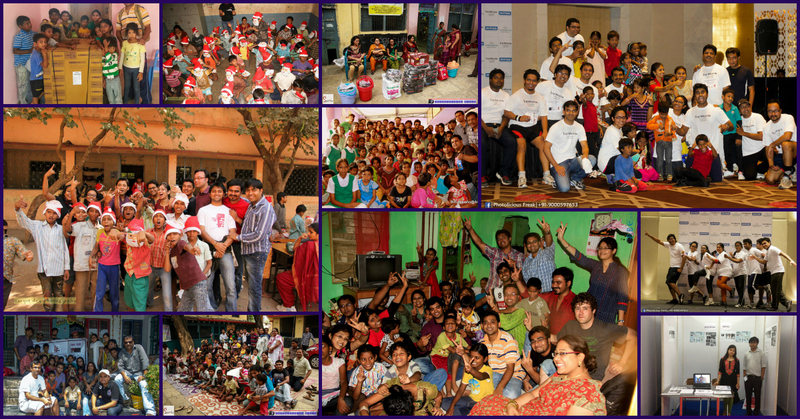 Wouldn’t it be just wonderful if we could get associated with any of these struggling NGOs and make their dreams ours! This thought led to the foundation of Sporsho in 2008. But like any other NGO, Sporsho had to go through its share of struggles and could actively start contributing only in 2012. Sporsho or “the touch” aims at supporting existing NGOs like Rainbow Homes, Aman Vedika and Cheers Foundation in their noble endeavor of improving the lives of orphaned children. I am privileged to be a part of Sporsho for two years now. Every quarter, we pay a visit to one of these homes. We deliberately limit our reach to a handful of needy NGOs as we believe in consistent qualitative growth of a few over a scattered quantitative approach. We also do not believe in monetary contributions. A week prior to the visit, we collect all the requirements given to us by these NGOs. My favourite part of being associated with Sporsho is the day of the visit. As soon as we enter through the gates of the home, we are welcomed by a bubbly bunch of kids. They don’t hesitate in holding our hands, their “Akka-s” & “Anna-s”, as they guide us to a gathering. We sit with the kids as they introduce themselves; each of them echoing the same standard format, probably taught to them by their teacher, “I am ____. I study in ____. I want to be ___”. One can also make out that every single kid in the room is in their best dress for this much anticipated meet, their eyes beaming with excitement as they share a giggle, or nudge each other with their elbows. One look around the room would fill anyone with unfathomable hope, ambition and happiness. Minutes into the interaction, and the singers and dancers amongst them can be easily identified; one request is all it takes to make them perform. And who wouldn’t love to watch such enthusiastic kids perform, who share such a strong bond among each other? All this only makes one want to become a child again. When it is time for us to leave, all the kids come to us individually and say, “sister, please come again”. While we smile and nod our heads, we say to ourselves,”Sure, wouldn’t miss it for anything!” Their innocent smiles are our takeaway for the day. And our attachment and bonding with them are a promise for a better tomorrow! So often we lack the foresight the king had. We have at some point or the other told ourselves, ‘I wish I did better then!’ We have experienced and learnt. But what’s better, experience and learn or learn to not experience? Every time I visit the kids at their NGO-run homes, I ensure that they have a merry time. However, I can’t help but think that all of them will once have to leave the security and comfort of these homes and make a living for themselves. I encourage them to make the best of all opportunities and prepare themselves for the world that awaits them outside the walls. I feel it’s our collective duty to help improve the lives of less privileged. And especially for the kids, apart from providing for their material requirements, we also have a responsibility to teach them life’s lessons and open up their minds. © 2006-2014 bengalisinhyderabad.com. Ethereal theme. Theme images by ElementalImaging. Powered by Blogger.